Remote Controlled dimmer for TS1080 12V 2 Pin Warm White LED Strip. 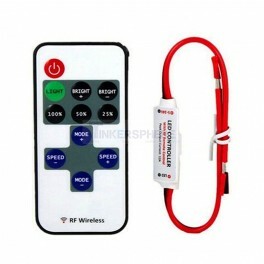 Use this to remotely turn on/off, dim or choose from pre-set modes. Press this key to turn on unit or switch to standby mode. Unit will turn on and restore the last settings that were there prior to shutdown. Switch to dynamic mode from lighting mode, or switch between different dynamic modes. Adjust playing speed of dynamic modes. Press SPEED+ to increase seed and press SPEED- to decrease. This unit accepts 5V to 24V DC power supply. The red wire should be connected to positive and black cable to negative. Please select proper power supply according to the LED application. 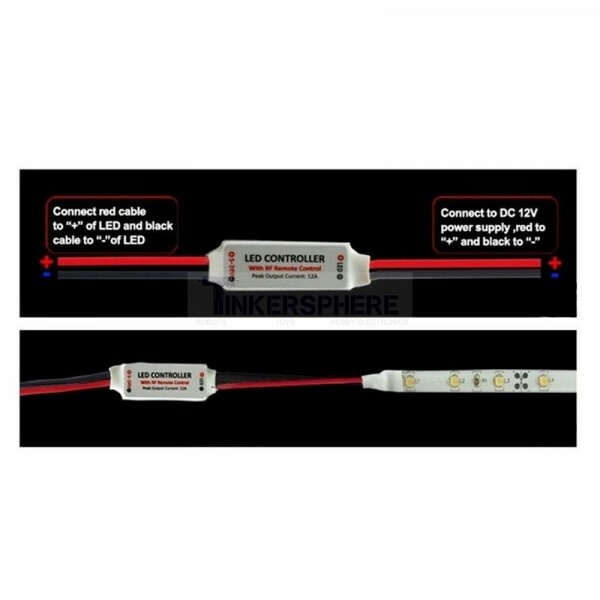 The red cable should be connected to LED positive and black cable to negative. The peak output current is 12A.